I don't know about you, but I love roaming garage sales and thrift stores looking for project ideas. I've upcycled and recycled my way to some awesome DIY home accessories, and I never stop looking for inspiration for my next DIY project. With the recent warm weather we've been having here in the Midwest, I've been looking to create some lovely vases to help display the flowers I've clipped from my garden. 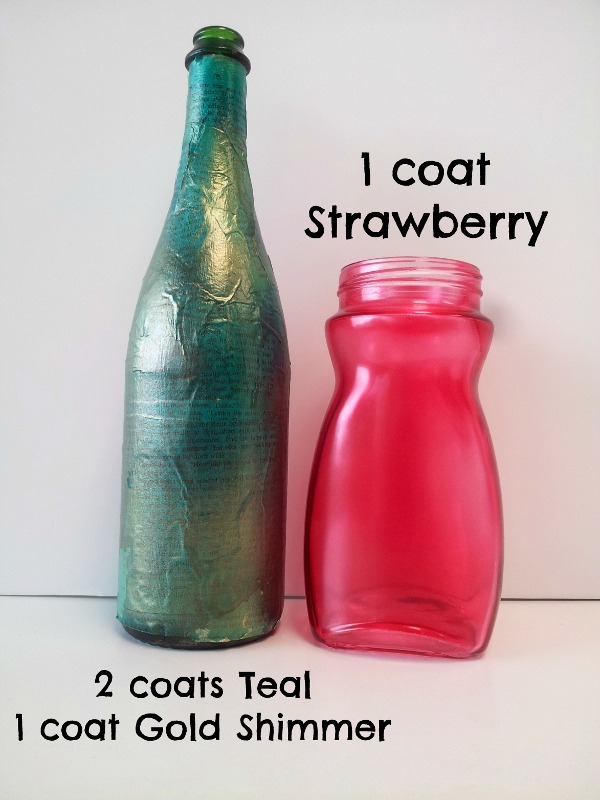 I had a lot of empty wine bottles and glass vases that were just begging to be painted, and I was so excited to use this new TintIT Multi-Use Transparent Dye from Design Master to create my projects! Available in a wide variety of colors, including Sepia, Chartreuse, Sunflower, Strawberry, Gold Shimmer, Sapphire, Mango, Plum, Jade, and Pinkolicious (my favorite! 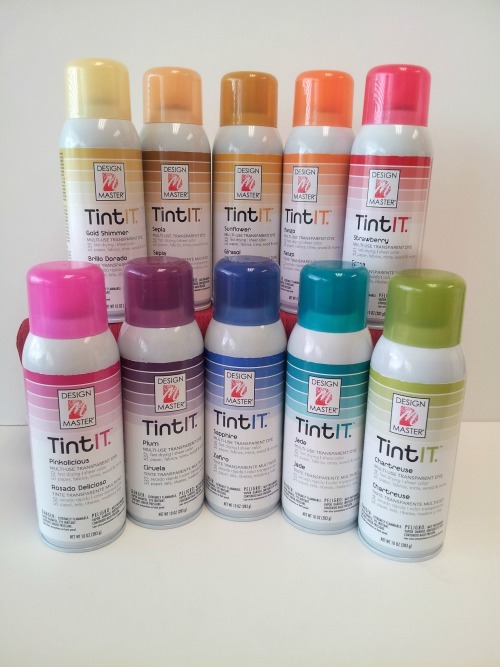 ), the TintIT Multi-Use Spray Paint quickly adds sheer vibrant color on raw, painted, or pre-finished items without hiding surface details. This spray paint dries in minutes and will not smear when moistened. It also won't curl or warp paper, so you can use it on scrapbook layouts and handmade card designs as well. 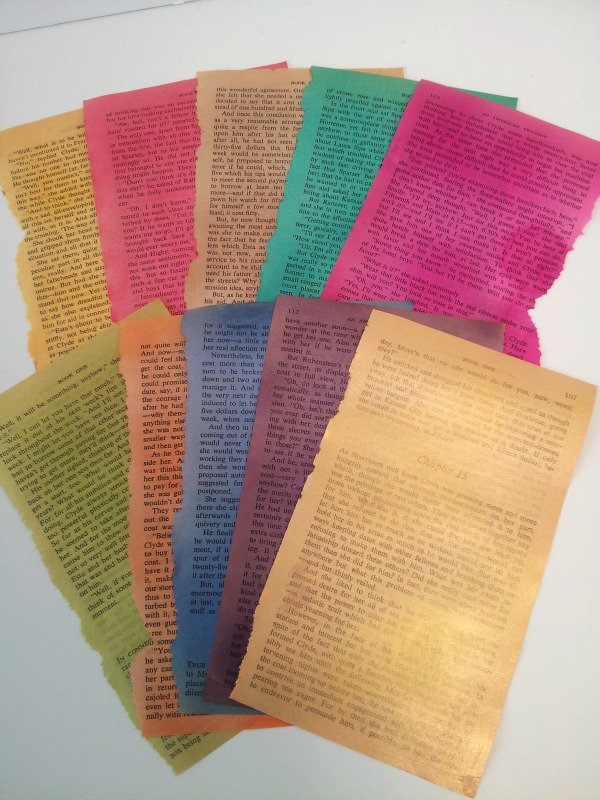 Before I got started crafting, I wanted to see what this spray paint looked like on paper...so I gathered 10 old book pages and gave each page one coat of spray paint. As you can see, the paint gives the paper a nice tinted look and I can still see the words through the paint. These book pages only have one coat on them...naturally the more coats you add, the darker the paint, but I liked them just as is! Once I knew how this paint would look, I got to work! First I took an old wine bottle and decoupaged it with old book pages. Then I gave it a quick coat of the Jade TintIT Spray Paint and let that dry. Once the paint was dry, I gave it a second coat, spraying heavier in some locations to give it more of a worn look. Finally, after the second coat was dry, I gave it a quick dusting with the Gold Shimmer TintIT Spray Paint to finish it off! I also wanted to see what this spray paint would look like on a simple glass vase...I had an empty jar lying around my recycling bin, so I gave it one coat of the Strawberry TintIT Spray Paint and I LOVE how it turned out! The glass is still see-through but it has a lovely red tint to it that would be beautiful for Valentine's Day or Christmas decor. Has anyone tried this on fabric - looking to try it on muslin and wondered how it would work. Does the fabric feel the same afterwards? Thanks.